Western Kentucky University's (WKU) Topper Transit Bus #13 is undergoing a big change this Earth Month. The shuttle will begin running on 100% biofuel for the campus' Earth Day Celebration on April 19 through a collaboration between WKU’s School of Engineering & Applied Sciences, Agriculture & Research Education Center, Restaurant Group and Parking & Transportation Services. Engineering students (WKU Biofuels) convert cooking oil previously used to prepare french fries, chicken, and other favorites in campus restaurants to biodiesel at a facility at the WKU Farm. 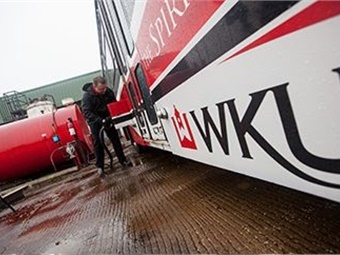 WKU Biofuels has been converting campus dining used cooking oil into fuel at the WKU Farm since 2013. The biodiesel has been used to run tractors and reduce farm fuel costs and carbon emissions. The collaboration between Agriculture and Engineering programs engages students in real-life problem solving — the facility was designed, built and is operated by students in the Mechanical Engineering program. “The biodiesel project continues to be a very real and hands-on way to connect engineering students to functioning mechanical systems and prepare them for future collaborative projects,” said, Troy Robertson, an engineering technician for WKU School of Engineering & Applied Sciences, who advises the biodiesel project. 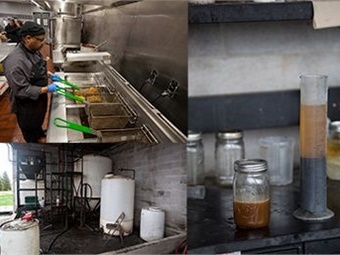 The students retrieve the used cooking oil from dining locations on campus and transport it to the WKU Farm, where it undergoes a process of heating, drying, and mixing with methanol and lye (known as methoxide) in a process called transeserification. The methanol and vegetable oil are turned into biodiesel and glycerin. The byproduct glycerin is removed and the lye is washed from the biodiesel, which is then dried and after final testing is ready to be used as fuel. RELATED: Can Public Transportation Save the World? The benefit of this entire process is that vegetable oil, which has already been used for its main purpose of feeding people, and one gallon of a traditional hydrocarbon (the methanol) can be converted into nearly five gallons of biodiesel — making it unnecessary to burn those gallons of traditional diesel fuel. The conversion of used cooking oil to biofuel eliminates the oil as waste and converts it to a clean burning fuel, significantly reducing carbon emissions and other environmental impacts. Having produced more than 5,000 gallons of biodiesel, WKU Biofuels students and staff are experienced in the process and ready to take the project beyond the farm and onto the WKU campus. WKU Parking and Transportation Services will use the converted cooking oil to fuel shuttle #13, which runs the White Line. While riders will not notice any difference in the shuttle’s performance (except maybe the faint smell of french fries), educational information on the bus will promote awareness among passengers of the significance of the bus as a sustainability best practice. This story was originally published by Western Kentucky University.